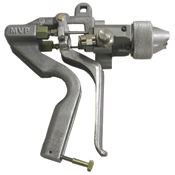 Magnum Venus Products’ EMG-1000 external mix gun is ideal for your external mix gelcoat operations. The stainless steel and aluminum construction will stand up in rugged and harsh environments, and the ergonomic design relieves hand strain for the operator. The EMG-1000 Gun features a replaceable head thread. Complete immersion in solvent will not effect the performance. This Gun performs with legendary dependability. With fewer parts, the EMG-1000 gun is significantly lighter than the competition. The EMG-1000 features an overall reduction in gun weight, balanced design handle and trigger, putting the weight of the gun further back over the hand for a distinct ergonomic difference.